A couple of wild turkeys make their way across Eads Park on Sept. 14. On my riverfront bike route the other day, I was surprised to see two wild turkeys in Eads Park. A couple of days later they stuck around long enough for the long-distance images you see here. Even though I ride through that little park on the eastern riverfront two or three times a week, this was a first for me, but it seems turkey sightings are routine. So turkeys seem to be regular residents of the riverfront and at least some of the city’s parks. I asked Dala Rouse, a neighbor of Eads Park, about turkeys there. 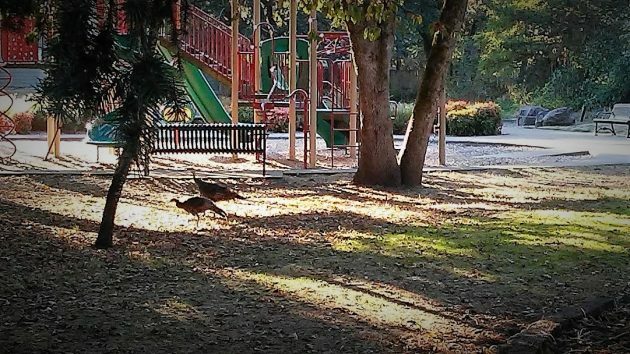 On this afternoon the turkeys had the Eads Park playground all to themselves. Had 5 hens walk through heatherdale trail park earlier this summer. 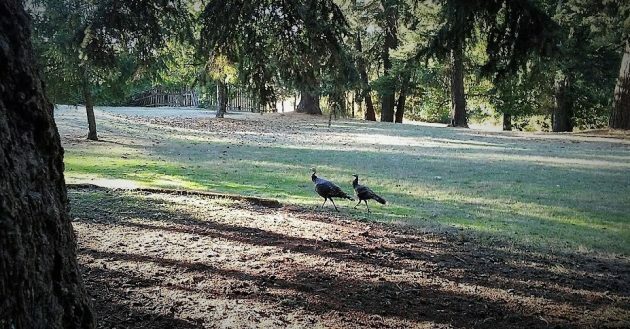 I’ve had as many as a dozen turkeys near my residence in NW Corvallis. They are frequent visitors. In Philonath there were so many in the past that they were being exterminated. Wild turkeys are NOT indigenous to Oregon. ODFW introduced them in 1961 and since then they have become pests, just check with Jefferson, Brownsville, etc. If you are having a problem with them roosting on your vehicles, tearing up your flowers, providing unwanted fertilizer, etc. call ODFW and ask for a “HAZING PERMIT” which allows you to use certain measures to discourage the pest.